Maintain (or start) their heartworm prevention regimen. Begin flea and tick prevention, if you haven’t done so already. Feed them dog-friendly fruit and veggie treats to give their diet a healthy boost. Below are a few more springtime pet care tips to follow over the next few months to keep your pup safe and healthy. Follow the link above to view The Humane Society of the United States’ full list of plants that may poison your pets. If you live in a region that has experienced cold temperatures these last few months, there is a good chance you and your pet have been somewhat inactive while staying indoors during winter. Rather than jumping right back into long walks, intense hikes in the wilderness, and other high-impact activities, you’ll want to ease your pup back into his or her exercise routine. Starting with simple and brief walks is a great way to warm up your dog’s muscles and joints, which can also help prepare them for bigger activities. Play fetch in the yard to get them used to running and jumping so that they are slowly introduced to these and other activities that can lead to a Tibial Plateau Leveling Osteotomy (TPLO) and other common orthopedic injuries. Many people follow the “spring cleaning” tradition of deep cleaning their home and tossing out things they no longer need or use. This is also a great practice to get into for your dog’s toys, gear, and everything in-between. Give all of their toys, leashes, collars, harnesses, and bedding a good cleaning to remove built-up grime and dirt. Toss any that are damaged as these could become choking hazards. If you have puppy toys that your dog has become bored with or other supplies that you no longer want or use, clean them and take them to the nearest pet shelter as a donation. 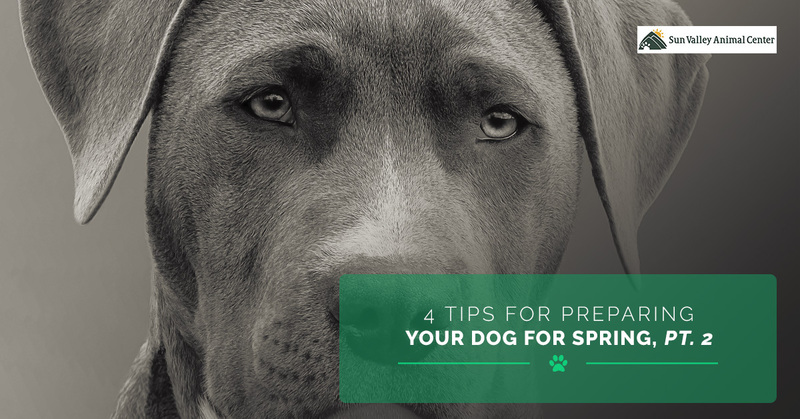 These are just a few more ways to get your dog all ready for the warmer weather. If you would like to schedule an appointment for a canine wellness exam, a consultation for a surgery, or any other veterinary service, call Sun Valley Animal Center today! As a Top Rated Local® animal center and veterinary hospital, we are always here for you and your dog! Join us next time as we share more insights into seasonal pet care. Until then, thanks for reading!